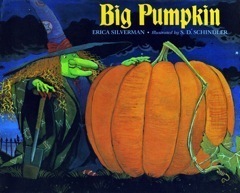 The witch has grown the biggest pumpkin ever, and now she wants to make herself a pumpkin pie for Halloween. But the pumpkin is so big she can't get it off the vine. It's so big the ghost can't move it, either. Neither can the vampire, nor the mummy. It looks as if there'll be no pumpkin pie for Halloween, until along comes the bat with an idea to save the day. How can the tiny bat succeed where bigger and strong spooky creatures have failed? You'll be surprised!